Lately, I've been jamming on jams. No, not the kind you find in jars (though, let's be real, I'd never pass up a perfect triangle of toast slathered with some homemade jam or preserves). I mean the things in life that make you light up and say, "That?! Oh, that's my jam!" I'm thankful to be part of Book Club at Buffer, where we most recently read Brene Brown's Rising Strong. (If you're not familiar with Brene's work, please go read everything by her. I'll wait here in the meantime and have pie for you when you get back!) As my teammates and I chatted about vulnerability, someone mentioned that part of being vulnerable means allowing yourself to 'feel the feels' without guilt or shame for your emotions. I'm no stranger to going against the grain, so the idea of granting myself a permission slip really stuck with me. Lately, I've been putting a ton of pressure on myself to not waste my free time and creating mental lists of what I should be doing. Confession time: I am a doer. To a fault. I like to go, go, go and squeeze every last drop out of my weekends if I can. Most times this involves running errands, household chores, scurrying off to farmers markets, and taking on fourteen overly ambitious kitchen projects at once. While I often feel pretty accomplished on Sunday night, being constantly on the go can get a little exhausting after a while. It's been so liberating to absolve myself from ideas about how I should be spending my time and to instead embrace the attitude that my time is mind to spend...on whatever grand or trivial thing I choose! Though I made a few different pies over the past month or so, this one might just be my favorite. You can get the pie crust recipe in the book, or here, or you can use your favorite crust recipe. For the filling, I used mostly strawberries (that I picked! ), with a stalk or two of rhubarb. It's also got a spoonful or two of strawberry-balsamic jam because, well, it's my jam. 2 10" pie crusts, chilled. 1. Pre-heat oven to 425F. 2. Reserve the 1 tbsp of sugar and set aside. 3. Mix together remaining filling ingredients in a bowl and set aside to hang out while you get the pie crust ready. 2. Roll out each pie crust into a 10" diameter circle. Place one pie crust in the bottom of a 9" deep dish pie pan. 3. Add filling to pan. 4. Cut lattice strips or get funky with some cookie cutters to make your pie crust look extra swanky. Top the pie with the lattice in a weave pattern or your cut out shapes. 5. Mix together egg yolk + water to make an egg wash. Brush the top of the pie with the egg wash and sprinkle with the 1 tbsp of sugar. 6. Bake until the crust is a lovely golden brown color and the inside of the pie is bubbling nicely. Remove from the oven and allow to cool, then serve with some ice cream or whipped cream and write yourself a permission slip to enjoy a slice, or the whole damn thing. I won't judge! A few weeks ago, I renewed my passport. In the process, I dragged out my old passport and couldn't help but reflect on the amazing places I'd visited in the last ten years. My mind whirred with the sites, sounds, and (perhaps most vividly) tastes of dishes I'd eaten across the globe. I smiled thinking of friendships forged across oceans, deepened by conversation and good food, and since-sustained by social media. My heart was thankful for each hug goodbye and each opportunity to explore somewhere new. In light of embracing balance and self-care, I decided to treat myself to a long weekend of doing things that made me happy and that I wanted to do. I indulged in some guilty pleasures (I'm a big fan of hot dogs), and also made myself some super healthy smoothie bowls. I spent an entire day purging things I didn't need and another day laying on the beach reading. I also treated myself to my favorite summertime activity--strawberry picking. I picked a total of 11 lbs of strawberries in all and I have major plans for all of them! I'll likely make some acai bowls, some sorbet, freeze some, and then save the tiny guys for some strawberry preserves from my pal Autumn's new book, Beyond Canning. How do you treat yourself? Do you have a favorite donut recipe? Leave a link in the comments! Happy #NationalDonutDay! There are some people in this world who can find joy in anything. My dear friend Dara is one of these people. Whether she's riding bikes through Amsterdam, camping in Death Valley in July, or going to trivia at the local townie bar, she always knows how to make the most of her environment. She has the most genuine laugh of anyone I've ever met because she tries to enjoy life to the fullest. I admire Dara's positivity and spirit so much! She is one of the most appreciative people I know. She sends cards in the mail just to say hi, even if we're meeting up that day. Or she'll send a thank you note to show her appreciation just for being her friend. Seeing her very unique handwriting on the front of a piece of mail can pretty much guarantee that a smile is on its way. She's helped me on a bigger scale as well. When I was going through a rough patch before leaving Philly and was mired in anxiety, she always made pause to appreciate what was good in my life. When I beat myself up, she reminded me of my strengths and helped me to look at stress as a challenge and an area for improvement. She also taught me the importance of self-care, even if it's just treating yourself to a new nail polish or getting to bed an extra fifteen minutes early. As we've been friends these last few years, her positivity has certainly rubbed off on me! I value self care immensely and find myself doing things like listening to my body when it wants to stay in instead of going out, speaking to myself with more kindness, and focusing on the positive instead of worrying. 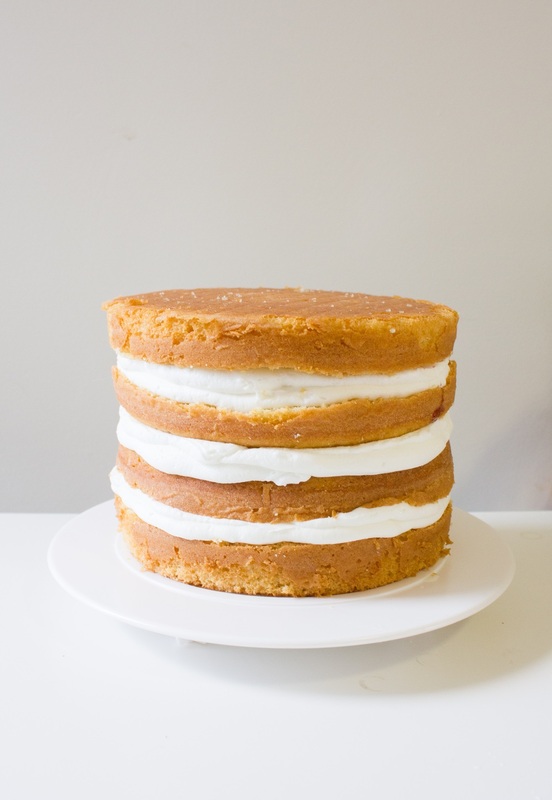 So, in a tiny attempt to celebrate the lady who celebrates the small stuff, I wanted to make a small layer cake that was both simple and elegant. I used this recipe for the lemon layer cake, filled the first and third layers with black raspberry preserves, the middle layer with homemade strawberry jam and made a dairy-free frosting with lemon extract. I topped the little cake with some fresh figs, grapes from my friend Susan's garden and some delicate pink currants. I'd say it was a success!